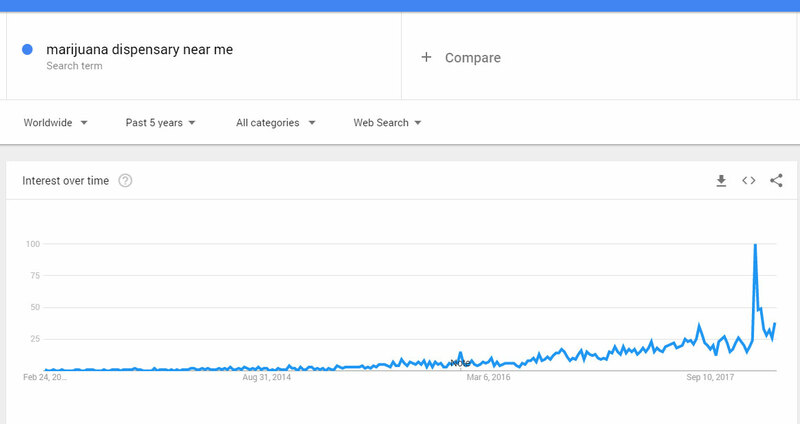 Did you know that “near me” is one of the fastest growing searches of the last few years? 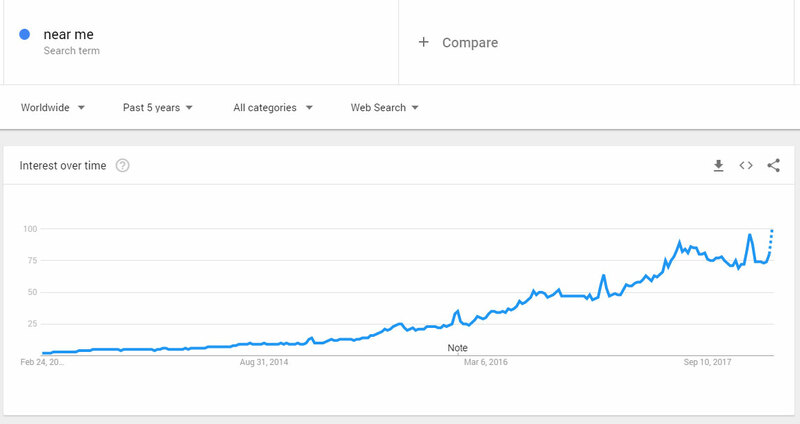 Thanks in part to better location targeting and the rise of mobile searches, searches containing “near me” have basically doubled in the last two years. While many locally-focused industries have seen similar trends (like “restaurants near me”), the growth of “marijuana dispensary near me” has been even more dramatic. The cannabis industry has several first-time users who legitimately do not know where to find dispensaries near them. New markets are opening up all the time, bringing new businesses with them. Laws can change from city to city, so the nearest dispensary to a searcher may be several cities away. Some searchers prioritize proximity, especially if transportation is an issue. Google reviews can have a massive impact on rankings because they allow Google to learn about a business from its customers. If you want to rank for more “near me” searches, focus first on the quantity of reviews. It’s okay if you have a few reviews that aren’t 5 stars, and some experts believe that having a few bad reviews can even make your listing look more authentic. Just to be clear, we’re talking about the number of reviews on your Google listing. Those reviews on Leafly and Weedmaps won’t help nearly as much, because Google has a hard time confirming their legitimacy. When someone links to your website, the text that they use to link can have a big impact. If blogs, associations, and news outlets link to you with words like “dispensary in Oakland,” that sends a very strong signal to Google that you are legitimate, local, and newsworthy. Then, if someone in Oakland searches for “cannabis near me,” your chances of showing up first grow dramatically. Here’s a weird search factor: it turns out that businesses with more Google my Business profile views rank a little better for “for me” searches. We’re talking about situations when a user opens up your business profile to learn more about it than can be shown in the local three pack. How do you take advantage of this? Uploading lots of photos, gaining enough reviews to demand attention, and using Google Posts can all help. If you somehow manage to get a link like “the best dispensaries in California,” that too can have a massive impact on your ability to rank for “near me” searches. If your dispensary operates in a city with a common name, like Springfield, it can also help Google determine which Springfield is yours. When this anchor text is consistent with the information in your Google my Business listing, Google will have better reason to believe that your listed information is accurate, which they often reward with better rankings. This one sounds obvious, but there is a little bit of nuance. First of all, when someone in Walla Walla, WA searches for “cannabis near me,” it’s only natural that businesses and dispensaries in Walla Walla take precedence over, say, dispensaries in Tucson, Arizona. Where this starts to get weird is that Google will actually prioritize businesses with addresses in Walla Walla even if you’re physically closer to a business just outside it. So, if you’re in Walla Walla, but standing 50 steps from the border of nearby College Place, WA, Google would still rather show you a business on the far side of Walla Walla than one just down the street. It’s not a perfect system, but it’s a work in progress. In the meantime, if you’re looking to relocate and found a cheaper property just outside of town, consider the SEO ramifications. If you’re planning on investing in SEO any time soon, it might be worth spending a couple hundred more a month to stay in town. Of course, ranking for “cannabis dispensary near me” isn’t enough to keep you in business on its own. A comprehensive SEO campaign for your marijuana dispensary will cover your “near me” searches and much more. Learn how we can help your brand grow. What Licenses Are Needed to Start a Recreational Marijuana Dispensary in California? #StonerCleanupInitiative: What is it and Why does it Matter? Cannabis Dispensary vs. Marijuana Dispensary: What Do Your Customers Call It?